About me - My name is Sowmya and I am wife, mom, daughter, sister………….. and I love to cook.. Hey that is my main reason for my blog Nivedhanam. I love to cook, read food blogs, watch cooking shows, read cookery books… OK you get the IDEA!!!! I enjoy participating in blog events, they are fun and you get to try new stuff and also get to see an interesting roundup of all the great recipes that have been submitted for the events. I am a strict vegetarian (no eggs) and my blog will also be the same. I love to bake and I am a little health freak. I generally try to make the recipe healthier even if it is small Like substituting whole wheat for all purpose flour, add wheat germ etc.. I am so excited to do this guest post for Jagruti of JCO. I wanted to do an authentic recipe and chose this vegetable which is very healthy and tastes amazing. 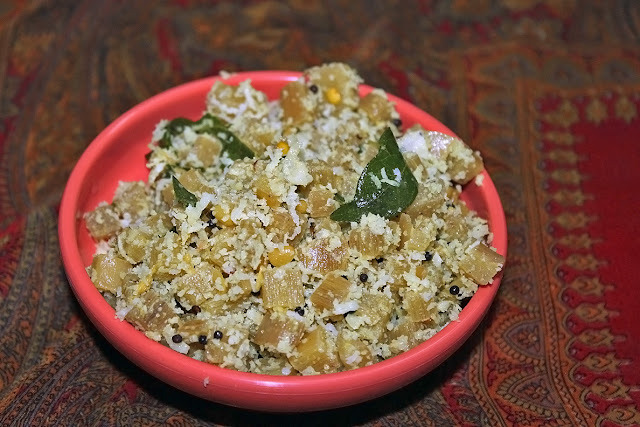 Jagruti has such a nice blog with so many events, variety of recipes from sweets to fried rice to biscotti. I wonder where does she get the idea for these events and recipes. Simply amazing. When I am in her blog, I love to spend so much time reading the recipes, may be even if I have read it before... It has a nice story, amazing drool worthy pictures and easy to follow recipe. 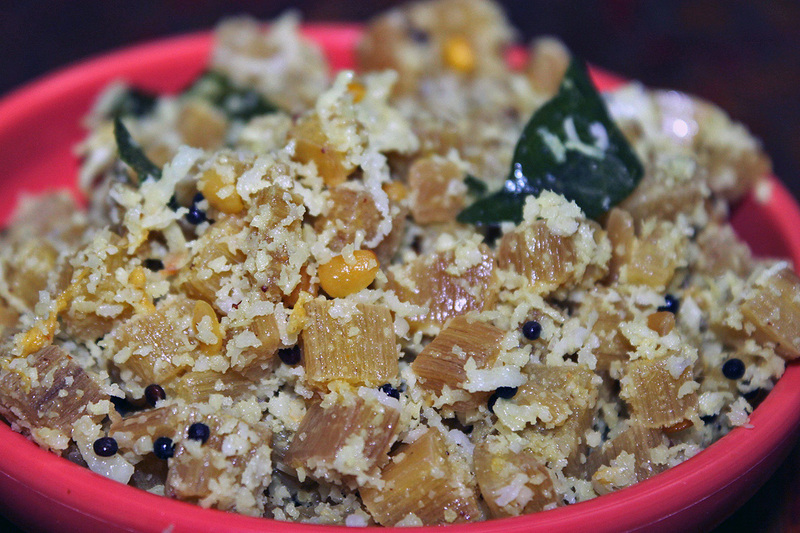 Vaazhaithandhu (Banana stem in English) is a very fiber rich vegetable. There are lot of interesting things I can relate to banana. One - my amma says “ஆளை இள்ளைக்குமாம் கீரை தண்டு, ஆணையே இள்ளைக்குமாம் வாழை தண்டு” - meaning people will slim down if they eat spinach, but elephant itself will slim down if it eats this banana stem. Another is the song from MGR Film – “ தனையே குடுப்பதில் வாழைக்கு ஈடு” – meaning – “self sacrifice like the banana tree which gives everything”. You can use all the parts of the tree. Like the leaf can be used as a plate, banana, plantain, banana stem, banana flower - all can be eaten by humans. This is very easy kari. The tedious or the time consuming part is the cutting of this vegetable. I am not sure if I can say it to be a vegetable. It is a stem. While cutting the banana stem, you will get many fibers, remove some if they are tight. Once the mustard seeds crackle, add the ulutham parupu and red chili. Yummy and delicious sabji !! Glad to meet you, Jagruti! Nice guest post from Sowmya! First time to encounter this dish, and I must say it's really interesting. Nice way to bring back some good old banana stem. Glad to see the guest post series Jagruthi.